27 years in education. All at Anadarko High School. 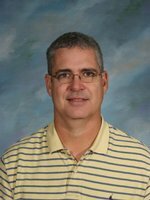 I began my teaching career as a temporary instructor at Anadarko High School in January 1990. Later, I was hired as a full-time employ for the 1990-1991, as a science instructor and athletic coach. My coaching career continued for 13 years, coaching football, baseball, and a few years of wrestling. I truly loved my coaching assignments, but resigned my position to spend more time with my wife and three children. As of 2017, my teaching career has continued 28 years. I feel fortunate to teach the subject matters, I enjoy most in life.